As a committee member for the Isetta Owners Club of Great Britain, and an owner of a BMW Isetta 300, I always think fondly of Brighton. The Isetta was a small one door car, designed in Italy by a company called “Iso”. Isetta means ‘little Iso’. BMW bought the rights to this car from Iso and, using their existing motorbike technology, re-engineered the car so that it had, initially a 247cc 4 stroke air cooled engined, and then later a 297cc engine. In March 1957 the Southern Locomotive works on New England Street finished its last railway job and, 6 weeks later, re-opened to assemble Isetta’s, employing 200 local Brighton workers, most of whom had worked in the locomotive works on the railway vehicles. As the factory had no road access, all the parts had to be brought in by railway, and the assembled vehicles had to be sent out by the same method. At the height of production 300 cars a week were made which averaged out at one and a half per person. The Isetta factory made its last vehicle in 1964, the Isetta having been made extinct by the BMC mini, and the bubble car era came to an end. 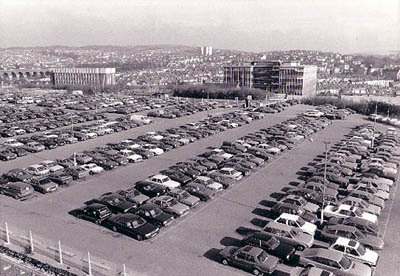 More recently, the factory was demolished and the site became a 900 capacity car park. This closed in the 1990’s and the space, the largest derelict area in Brighton, is soon to be developed into the New England Square. 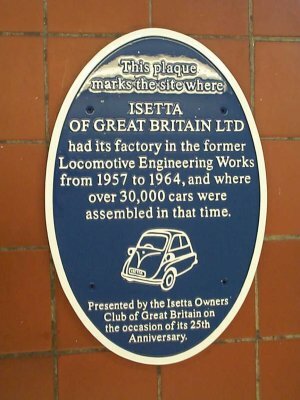 The Isetta Owners Club of great Britain presented a plaque to the site commemorating 50 years of the car on June 14th, 2003. The plaque was unveiled by Mr Leonard White, a former worker at the factory. Add to my previous comment….if BMW Isetta OC (page2) has forwarded information… I withdraw my comment, I didnt see page 2 ! Good site all the same ! I am one of the developers of http://openplaques.org/ Can anyone tell me whether this plaque is currently (Jan 2011) on display? With the redevelopment of the New England Quarter I believe that it will have been moved, perhaps into Sainsburys? I worked there for a short while on leaving school, wiring up the loom to the switches and fitting it to the instrument panel. Most were l.h.d. models for export to Canada. The shipments were held up due to frozen seaways there and there was redundancies so I left to start work at Lambourne & Ridley. The Johnson midget bus man was at Issetta at the time I was there also. I had a couple of customers with these in the early 1960s one of which was the four wheeled version. I had borrowed it to go to a show in London and coming down the old River Hill at Sevenoaks, long before the Sevenoaks by-pass was built, I managed to spin it twice in the snow fortunately without hitting anything. Winter of 1962/3 if you remember, started snowing on Boxing day and didn’t stop until Easter! The other one was a three wheeler and the customer had been on holiday to Wales. He thought there was a problem with the brakes and while I was testing it one front wheel locked up and went into a hole and over it went. Being a ‘bubble’ car and basicaly round it rolled through 360 degrees and landed back on its wheels the only significant damage being that the headlamps were pushed into the sides. A local bodyshop repaired it for me at a cost then of £35! What would you get out of any garage now for that? I told the customer, ‘It is a good job it didn’t happen when you were coming down one of those Welsh mountains’, but we still had to pay for the damage! I think a bit of grease had come out of the wheel bearing and got onto a brake shoe causing that brake to lock up. I suppose that on the lhd ones you mention Graham the door opened the opposite way to the rhd ones? I was told that you mustn’t park too close to anything in the front as some didn’t have a reverse gear and you couldn’t get out of them then. I think some had the reverse blanked off so that they could be driven on a motor cycle licence, ie: a non-reversible tricycle. This was also done on Reliant three wheelers for the same purpose I think.